There might be trade war brewing over steel and aluminum. But another trans-Atlantic war has already been raging for a couple of centuries over one of those heavy metals. Which came first: American aluminum or British aluminium? The word aluminum was coined by the English chemist Sir Humphry Davy in 1812. Davy first called it alumium in 1807, basing it on the word alumina (or alumine), the name given by French chemists in the late 18th century to the white solid — otherwise known as aluminum oxide — that is a major constituent of many rocks. (This word alumina derived from the Latin alumen, related to aluta meaning ‘tawed leather’.) But then Davy had a change of heart, and he changed his name from alumium to aluminum, which remains the American word to this day. 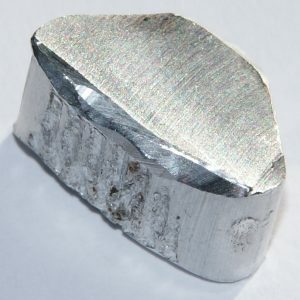 But then Davy and other British scientists and editors changed their minds yet again and decided in 1812 that aluminium sounded better, ‘cos it followed the pattern of other metallic element names like sodium, potassium and magnesium (derived from soda, potassa or potash, and magnesia respectively, and also named by Sir Davy), cadmium, iridium, lithium, osmium, palladium, rhodium, titanium, uranium, etc. So they added in that second ‘i’. And hence caused the other aluminum war.